"The Birth and Death of White Henny"
Raphael Montenez Ortiz, Ralph to Kurt, is a Brooklyn born artist of Puerto Rican decent whose lengthy career as an artist (he is now in his mid-eighties) includes what has been termed "destruction art." Kurt and Ralph became friends early in the 1960s, and Kurt covered Ralph's participation in the Destruction In Art Symposium held in London in 1966 in the pages of Artscanada magazine. Noted for his theatrical art pieces wherein Ralph destroyed pianos with an ax, beheaded live chickens, tore apart mattresses, and spilled buckets of blood, his work was and remains controversial and for many, uncomfortable. In this recording made by Kurt circa 1966, Kurt, Ralph and an unidentified woman discuss Ralph's plans for a theatrical art performance to be held in a gallery in Los Angeles, and Ralph exuberantly describes what it will include--namely chickens, mice, snakes, a piano, a harp, paper bags and buckets of blood--in his words "...a whole crazy kind of thing." Kurt suggests the work is a "menstruation ritual" and Ralph explains that his intent is to provoke people to the point where one "can't stand behind all your defenses." Note: Ralph's plans are graphically described; the discussion lasts about fifteen minutes. By 1966 Kurt had already gained recognition as an up-and-coming voice in the art historian community. His regular contributions to Art International magazine along with the attention he gained at UCLA for his unconventional teaching approach helped Kurt establish relationships with others with aspirations in his chosen field. Among them was the young Roberta Bernstein, who felt great affection for Kurt; Roberta did indeed fulfill her aspirations and today is a recognized leader in the field art history. This charming 1966 letter about her visit with Andy Warhol has its place in the history of both Roberta and Kurt. The late sixties were a period of ferment in the arts, and the notion of intermedia--the mix of art, technology, kinetic environments, mixed-media, dance and more--became popular as conventional art boundaries began to dissolve. The idea of "happenings" was hot, and Kurt "dug the scene". Among his archives are materials related to various intermedia events and organizations, such as E.A.T. and USCO. Robert Rauschenberg was in the forefront of such movements, and embraced such collaborations. Below is a flyer about an event, Intermedia '68, held in New York, managed by John Brockman Associates, who later acted as a book agent for Kurt. (Photo: Carolee Schneemann performing an enviromental theatre piece). Kurt's study and visits with Hopi Elders in the late 1960s made a lasting impression on him. He was among the first non-Hopi to receive Hopi permission to hear about their prophesies, and he spoke about them often. Among Kurt's artifacts are the Hopi Kachina Dolls above. 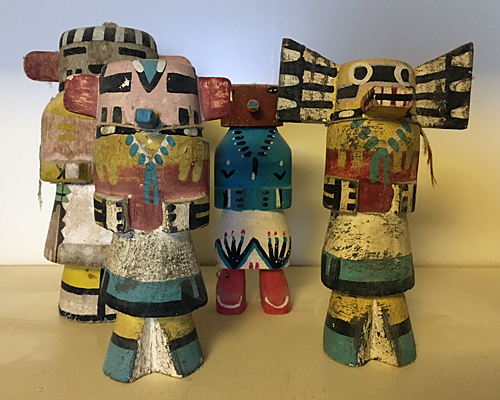 Traditionally, Kachina Dolls were carved by the men in Hopi tribes, and presented to girls in the tribe along with sacred teachings. The "dolls" generally replicate particular design features, and the ones pictured above, which are old, feature snout-like mouths. In 1988, Artist Fritz Scholder (1937-2005) paid a visit to Sacramento. He had attended Sacramento State University in the late 1950s, and a book about his work had just been published. Scholder gave a talk and Kurt, naturally, made sure it was recorded and later transcribed. The final transcription has Kurt's proofreading marks all over it. It's a wonderful talk, illuminating and entertaining. And this transcript, found in Kurt's archives, is a welcome addition to the material available about this important artist. Kurt's interest in Marcel Duchamp was long-standing. Here's a note he typed to himself on September 16, 1985 in which he references three works by Duchamp, all incorporating the use of twine. As we now know, he then focused upon A Bruit Secret as the the vehicle for his 350,000-word opus, which he completed in 1991. Images of the works mentioned are included here.